Clio & Phineas: Meet the Trample Herd! Finally some cute knit stuffies for me! Back when I commented that I wanted to knit myself a herd of elephants to trample my enemies you probably thought I was kidding. I wasn't. 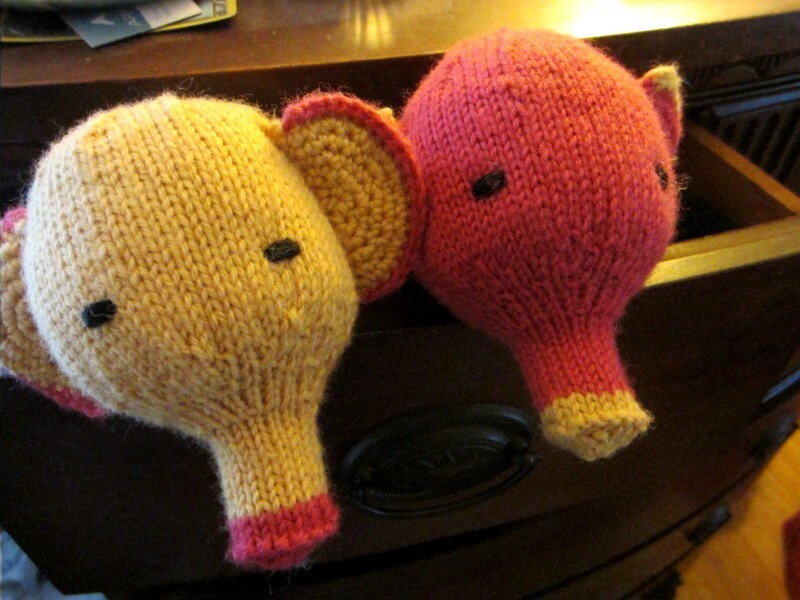 And now I've knit the first two of them into being. I knit these elephants from the "page 18 elefante" pattern that is free on Susan B Anderson's blog. 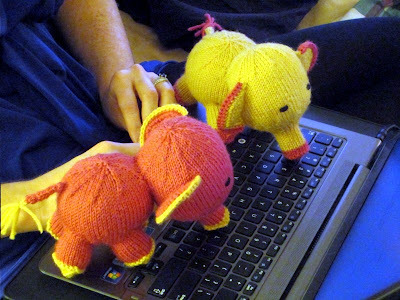 She really has cornered the market on adorable knit stuffies. 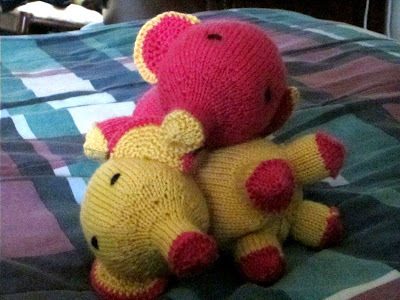 These cuties were knit up in the leftover yarn from my giraffe. They're small, and perfect for using up remnants. The only tricky part for me was the ears, which are crocheted. I don't crochet. 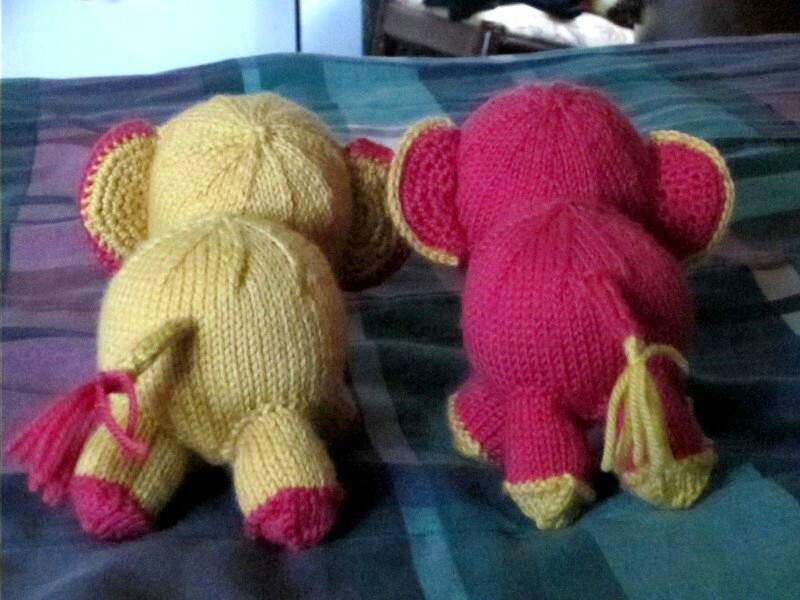 So, my little herd had to wait - earless - for a month while I struggled with a crochet hook. I'm pretty sure I was not destined to be a great crocheter, but I learned just enough so that they could have ears. I would not show them off to a crocheter since I had to fudge them a bit and each one came out a little... um... unique. I haven't really built up a yarn stash, since I'm not very good at seeing a yarn and knowing what I'd want to do with it and how much to buy. I've been buying as I go. But there is almost always a half a ball of yarn left at the end of a project. ...or playing in the Craft Lounge. Two is company, but not much of a herd. 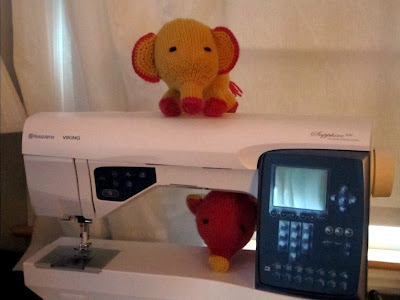 So, I expect that the number of trample elephants will grow over time as I use up the leftover bits. But in the interim, Daffy and Mingo will be guarding my Craft Lounge. YES YES YES. :-) love this. 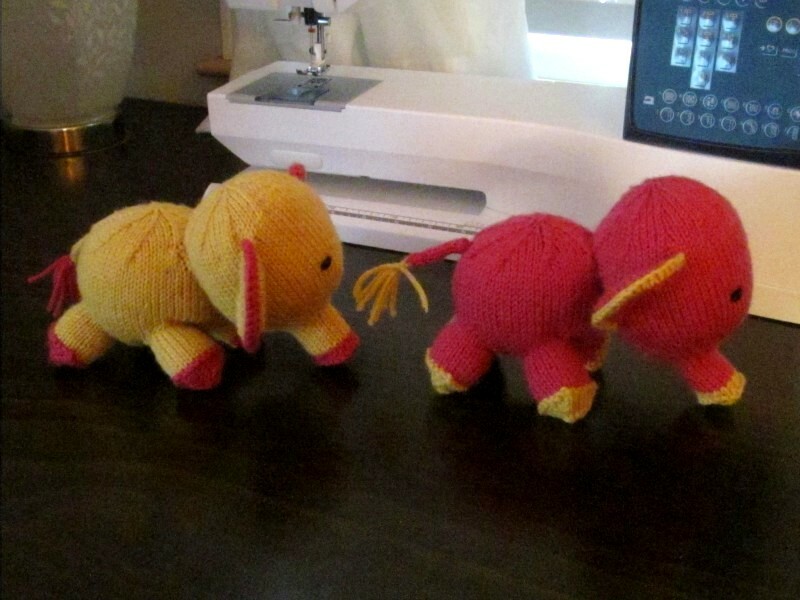 Seriously, more elephants to come. LOL We had way more fun playing with them than normal adults should. The animals are getting more and more adorable! I cannot wait to see the hippos. This was my "smile of the day"! Yay for a herd of elephants to trample enemies! They make me want to learn to knit. DAMN that's cute. I'm going to be saying "trample trample trample" to myself all day. Those are crazy cute! I love that they're a combo of crochet and knit, and that you learned to crochet just to complete these. Fun fun fun! LOL - Yeah, that speaks volumes about how much I wanted to make these cuties!